I have sometimes said that I agree with "conservatives" and "liberals" each about half of the time: when they are right by opposing the opposition. That may be a slight exaggeration- they are probably right less often than that. I agree more often with "conservatives" who are criticizing "liberals" than I do with "liberals" who are criticizing "conservatives". I have wondered why this is. I do come from a "conservative" family, so that might have something to do with it. 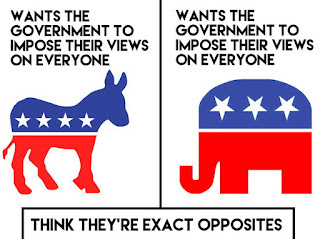 When "liberals" criticize "conservatives", they seem to always do so by advocating a Big Government response or solution. And that drives me away, even when I agree with the existence of the problem they are wanting to solve. Sometimes they whine over "fairness" or "feelings" or some other maternalistic garbage, and that loses me completely. 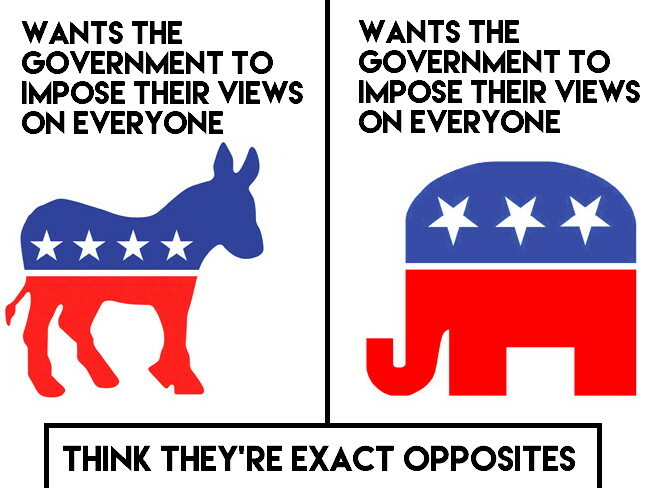 On the rare occasions when they criticize "conservatives" rationally, by pointing out their hypocrisy or inconsistency or ethical failings without suggesting the solution is more government, I can agree (while recognizing how funny it is to see people in glass houses throwing stones). When "conservatives" criticize "liberals" they usually do so by pointing out the stupidity of the "liberals'" Big Government leanings-- its history of perfect failure. Something I agree with. When they start talking "morals", "authority", or other paternalistic garbage, they lose me. And, no matter what anyone, on any "side", is criticizing, if their "solution" is a government project or program or "better enforcement", their solution is no better than the problem it pretends to address. Therefore I reject it utterly. There is either a better way, or the problem is best left alone.